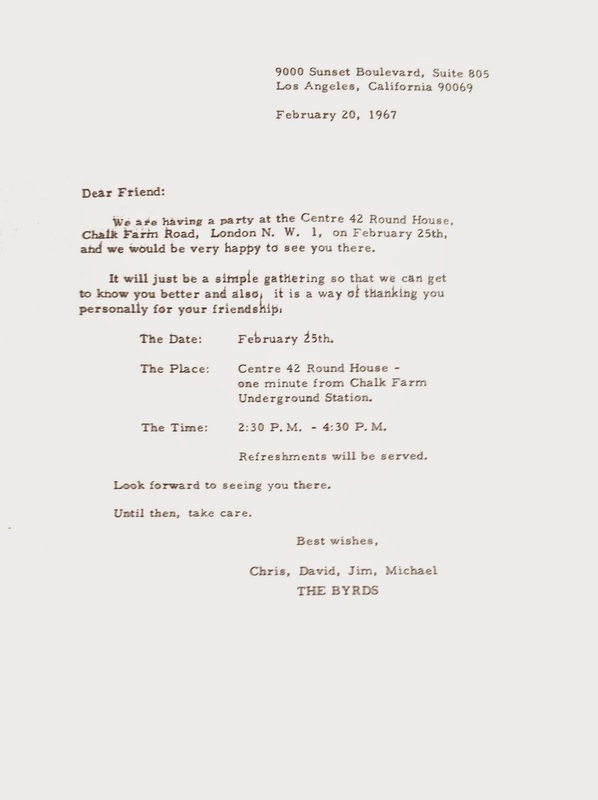 The Byrds had a small get together for die-hard fans at the Round House in London on Saturday 25th February 1967. I was there along with my good friends Tony Poole and Ross McGeeney, both later to find fame with 'Starry Eyed and Laughing', who seven short years later (April 28, 1974) played the Roundhouse alongside Michael Nesmith and Red Rhodes (amongst others). Simple twist of fate! Back to 1967 however; in true fan style we 'discovered' that the band were staying at the White House Hotel on Regent’s Park in London, so we all strode off and blagged the number of "Mr. McGuinn"'s suite from the front desk. Up we went and had the briefest of conversations with the great man, and emboldened by that knocked on the door opposite to find it answered by the ever voluble David Crosby! Wow, David spent what seemed like hours with us discussing all manner of subjects (I should have said we were 3 spotty faced schoolboys!!) and to this day none of us have forgotten the experience or his kindness. 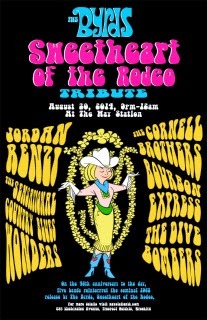 The Way Station continues their Tribute Series by honoring trailblazers of rock ‘n' roll, The Byrds, by celebrating the 46th anniversary (to the day) of their release of Sweetheart Of The Rodeo on Saturday, August 30th from 9pm-12am. Performing the entire Legacy Edition of the record will be Jordan Renzi, The Sensational Country Blues Wonders, The Cornell Brothers, Bourbon Express and The DiveBombers. Don't miss a single track as re-imagined by these most reverential performers. From folk rock to psychedelic hippie pop, The Byrds were pioneers of rock ‘n' roll from the start. However it wasn't until 1968, when they hitched their wagon to Gram Parsons, that they left their indelible mark on American music with their seminal album, Sweetheart of the Rodeo. 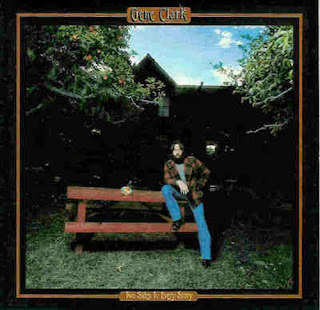 The traditional forms of folk, bluegrass and gospel laid the foundation for the very first major country rock album, and forged the creation of what became known as “Cosmic American Music”. 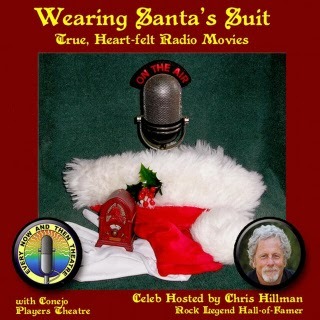 Chris Hillman, rock legend Hall-of-Famer and perhaps best known as co-founder of the The Byrds is Celebrity Host for Every Now and Then Theatre and Conejo Players Theatre's world premiere radio presentation of "Wearing Santa's Suit." The show will air on NewsTalk 1590 KVTA December 24th at 3pm and 9pm, then on December 25th at 7am, 12pm and 8pm. Based on actual happenings, the production allows you to enter the mind of Santa as he encounters all types at a harborside art festival, chamber mixer, private club, radio station listener party, children's shelter, his next-door neighbor, a panicked girlfriend, and one family's personal appearance request. Hillman, a Ventura County resident, is often cited as one of the early pioneers of the country-rock genre. His past bands include Manassas, The Desert Rose Band, The Flying Burrito Brothers and Souther-Hillman-Furay. As Every Now and Then Theatre's chosen Celebrity Host, Hillman will open the show and set the scene for the hour long broadcast. At the breaks, he takes us back in time with recorded Christmas comments from Ventura County's children- who are now adults. Hillman will wrap up the broadcast revealing the ensemble cast, nearly all of whom played multiple characters. "Wearing Santa's Suit” was directed by Shawn W. Lanz of Camarillo. Script and producer was James Wortman of Ventura. Onsite sound engineer was David Tuomi of Thousand Oaks. Post Sound Producer was Bob Allen from KVTA. The broadcast was made possible with resources from Barkerductions in Ventura for equipment, and Goldcoast Broadcasting for air time. CD copies of the broadcast are made available to cast and crew in trade for donations to KVTA's Children's Services Fund. Now in its 24th year, the all-volunteer Every Now and Then Theatre has won 35 international, national, and local awards for radio drama excellence. They are now part of the American Radio Archives in Thousand Oaks. Chris Hillman's website is www.chrishillman.com. Guitar legend Albert Lee is celebrating his 70th birthday with a special performance at The Canyon in Agoura Hills, CA on January 9, 2014. The show will feature special guest appearances by Emmylou Harris, Rodney Crowell, Desert Rose Band (Chris Hillman, Herb Pedersen, John Jorgenson, Jay Dee Maness, Bill Bryson, Steve Duncan), Peter Asher, as well as surprise guest appearances. 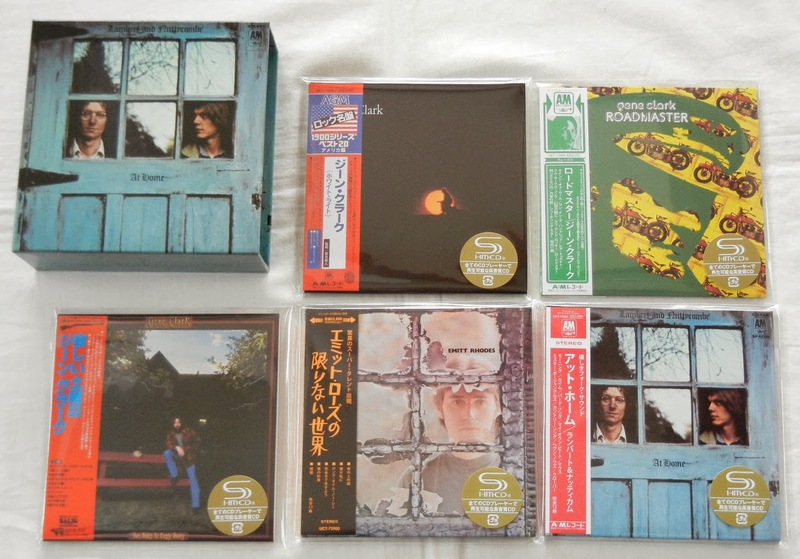 CDs and Promo Boxes are made in JAPAN. Promo box is an officially sanctioned release, made in Japan by Disk Union. We were lucky enough to purchase several still sealed copies of Gene Clark's long deleted (since the late 80s) CD version of his 1977 album TWO SIDES TO EVERY STORY. This CD was briefly released on Polydor in the USA in the late 80s, and was never re-released on compact disc. Some copies were sold on eBay for $150,00 + lately. and you'll get a reply within 24 hours. This is the real thing, not the long promised re-release by High Moon records for more than one year, that failed to appear. The live show was recorded for Roger’s mother’s 102nd birthday and the DVD is snippets from a few of Roger’s concerts and some conversations with dear friends about Roger’s musical journey. We didn’t get the editing finished as soon as we wanted, because the troubadour I married always puts performing first." She played with Paul Winter and many other great musicians.